Being born October 28, my daughter never had a huge birthday party: partly because of the conflict of Halloween festivities. So on her seventeenth birthday we decided to make it happen. It was a BIG deal for us! We wanted it special for her, but we didn’t have a lot of money to sink into this, so we got creative. We went shopping at second hand shops and thrift stores. We saw items that had been discarded by others; items that were past their prime; items that were calling my name! An old wooden door that once stood sentinel for someone’s home became a huge deck table. 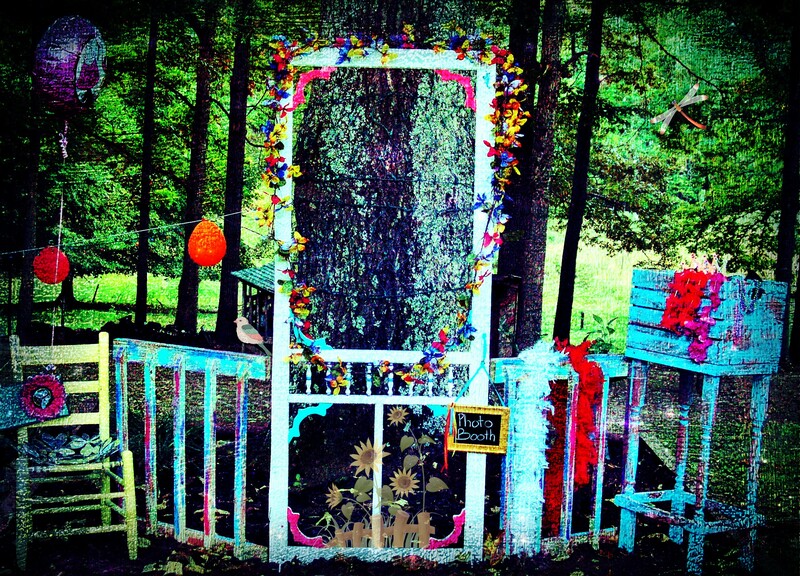 A discarded wooden storm door from up the street, was transformed into a photo booth. I made yard signs out of old kitchen cabinet doors that were long past their prime. Empty picture frames became chic little chalk boards. A bag of various fabric remnants became a decorative garland for our fence. I sanded, tore fabric for the garland, painted, sanded some more, and stained. The work took months of preparation. But it was well worth it. Old and unwanted items; items with wear and tear; items that once served one purpose, now served another. To give a new purpose or use to…. To change something so that it can be used for a different purpose….. This is what God does for us when He saves us. He cleans us up and gives us new purpose. He wants to develop in us our potential, our purpose, and put us in a better place. This sounds great! It IS great. But what about when you’ve been serving God for a long time? We can begin to feel a little wear and tear….we can even begin to question our usefulness. Everyone goes through seasons in life: when one season ends, we can feel like our purpose and usefulness is ending as well. We can begin to talk ourselves right out the next season God wants to prepare us for. “We humans keep brainstorming options and plans, but God’s purpose prevails.” Proverbs 19:21. God has plans for our entire life. Just like I changed a door into a table, God changes us from glory to glory (2 Corinthians 3:18). Our purpose may change, but our usefulness is never over! Thank you! This encouraged me so much too. God is so good to us! I’m so thankful he doesn’t throw us away, just repurposes us! Great word! Thank you! It’s so comforting to know that God values us.